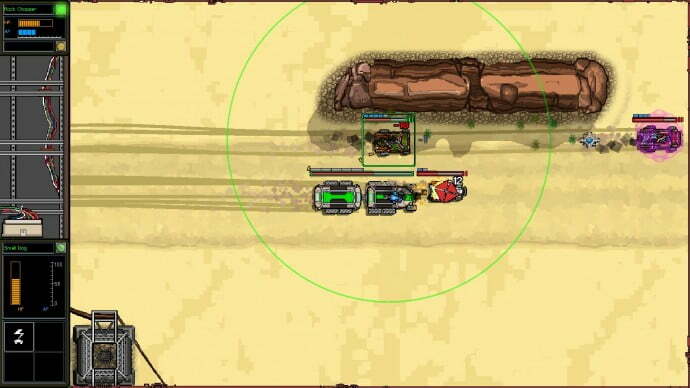 Convoy is FTL meets Mad Max, a chaotic strategy game of dust, trucks and fire. It certainly sounds appealing, but does it succeed in balancing its varied features and mechanics? Read on to find out. Sometimes, a game thrives because it pioneers a unique, never before seen set of rules, mechanics or systems. Other times, a game thrives simply because it learns from the successes and mistakes of its peers, and because its designers understand one important rule: if you’re going to steal, steal from the best. Such is Convoy, a game which can only be described as a tactical “CaR-PG” (if that’s not a thing, it totally should be), combining as it does the best elements of pen and paper RPGs and Mad Max, then injecting a huge amount of FTL-inspired rogue-like vehicular combat. It’s unashamedly derivative, which winds up being its greatest strength, and its most glaring weakness. After your spaceship crash lands on a post-apocalyptic wasteland planet, your convoy of attack transports must set out to acquire the correct repair parts. Standing in your way is a chaotic cacophony of raiders, tech-savvy cults, privateers and wholly unpredictable wildcards, all of whom may or may not be out to get your fuel, your parts or your life. One of about thirty five “Oh right. Now I’m f*cked” instances. These potentially dangerous encounters occur on the game’s world map, and take the form of fairly familiar “Choose Your Own Adventure” scenarios. You might be accosted by feral, jersey-waving football hooligans, you might be approached by mystical desert hermits, or you might encounter mysterious raiding parties intent on drugging and robbing you in the middle of a saloon. There are plenty of scenarios that test your morality, foresight and ruthlessness in various entertaining ways, although after your first five deaths, it’s likely you’ll start to encounter some of the same scenarios over and over again. The unpredictability of these encounters adds to the game’s chaotic, Mad Max feel, but the restrictions implemented by Convoy’s combat don’t quite gel with its Oregon Trail-esque overworld. Your convoy only has two resources at its disposal: fuel and parts. Fuel allows your vehicle to keep moving and can be used to escape some sticky situations more easily, while parts can buy new weapons, repair transports, and purchase new transports for your convoy. This means that most overworld encounters generally end in one of a few conclusions: you need to fight somebody, you lose or gain fuel or parts, or nothing of any consequence happens. It’s tempting to engage with these encounters, in order to experience some of Convoy’s wacky characters and factions, but it’s generally more beneficial to your cause to keep on driving. There’s a natural imbalance to Convoy’s world; everyone is out for themselves, and most people are willing to put you down in order to further their own agendas. Being a benevolent soul will get you shot, but being a ruthless psychopath will… get you shot, so attempting to get the simplest of tasks done can be a constant uphill battle. 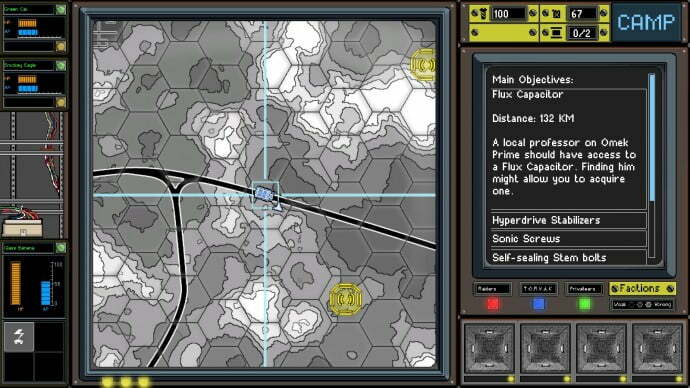 Though it’s functional and easy to use, Convoy’s map is something of an ugly duckling. Like a really grey ugly duckling made out of old radios. 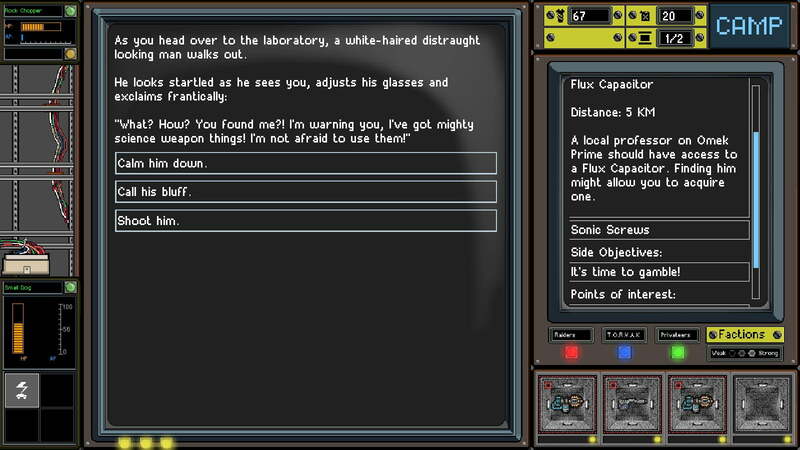 Convoy‘s economy doesn’t feel developed enough to offer a breadth of interesting stories. Running out of fuel never really matters, because there will always be some contrived way to acquire more whilst stranded in the desert. Upgrading vehicles is important for core combat, but if your transport careens into a wall, no amount of health or armor upgrades will save it from a fiery death. Conoy tests your moral compass, and occasionally your tactical prowess, but most of the time it succeeds only in testing your luck. Because it’s impossible to set up camp and repair your convoy outside of designated camping zones, a game can completely turn at the drop of a hat. You might be in charge of a will equipped, well upgraded convoy of transports, but one wrong decision in a non-combat encounter could effectively end your game for good. It’s this seesawing insanity that keeps Convoy interesting, but also makes it hard for players to feel like they’re making any tangible progress. Some scenarios are rather charming and well written, while some rely too heavily on cheap pop culture references. As for transport combat itself, there’s an awful lot to like about laser-blasting raider trucks whilst avoiding desert debris, and there’s enough tactical diversity to each fight to make for a variety of new challenges. But as with Convoy‘s overworld encounters, there’s a fantastic foundation here for some intense conflicts, but the execution leaves me somewhat wanting. 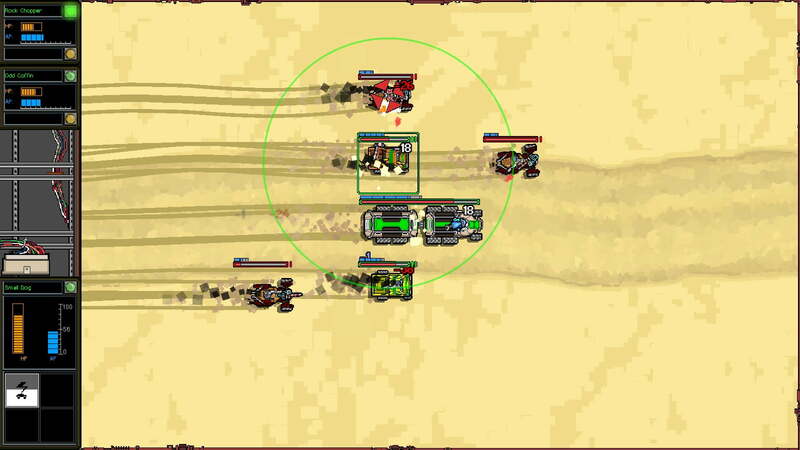 Each battle takes place on a single desert track, and requires you to protect your main vehicle from being blown to smithereens – either by herding enemy vehicles into debris with your smaller trucks, or simply by pounding them with heavy weaponry. It’s a fast paced and occasionally overly-busy affair, which can often lead to costly mistakes that end your game outright. Though the pause function helps with issuing commands inside a tight time frame, it feels somewhat at odds with the fast-paced car-mageddon unfolding on screen. Convoy might have worked as turn-based or real-time strategy, but it doesn’t quite hold up as a mixture of both. When combat works, it REALLY works, and delivers some satisfying carnage. Though the linearity of the combat works on a mechanical level, it’s completely at odds with the random, unpredictability of the game’s setting. You can feel secure, powerful and in control during a firefight – because firefights come with strict, unbreakable rules – but that’s all taken away when you enter the overworld. It’s all very well and good being told you’re about to encounter “a lot of enemies”, but that doesn’t say anything about their weapons, armor, speed etc., or even the concrete number of transports that will appear in a fight. You might be perfectly well equipped to deal with three or four vehicles, but completely helpless against an onslaught of eight armored transports, which makes gambling and risk taking even less enjoyable in the overworld. It doesn’t help that the game’s visual style has been ripped straight out of FTL, at least in terms of its simplicity. 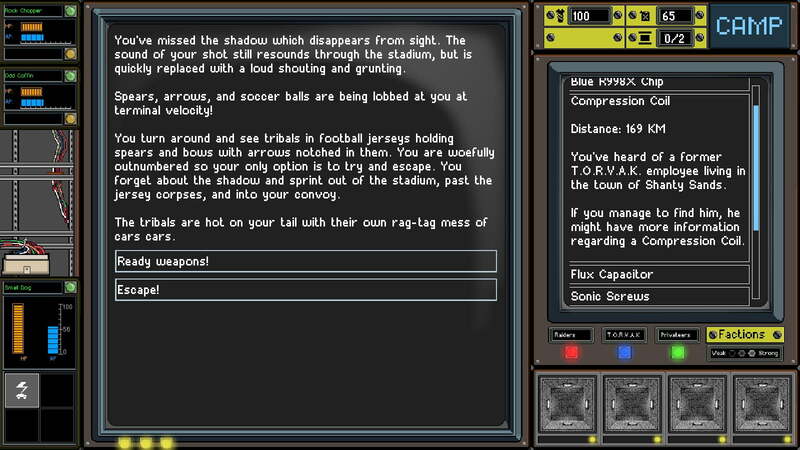 Combat encounters are presented in muted pixel art, which makes digesting information easy, but also renders each faction and vehicle appear interchangeable and surprisingly uninteresting, while the world map is a particularly sparse and colorless grid of blackness. It’s not exactly bad looking, but for a world that pops with flavor, danger and exploding trucks, there’s very little personality to Convoy‘s visual design. Must have been (insert football team here) fans, right? Everything about Convoy should work a little better than it does. It borrows heavily from other sources, but fails to borrow the minutiae which made those sources so successful. Though it’s passable in its attempt to recreate dusty, Mad Max-ish demolition derbies, it never quite balances its varied systems and mechanics. Its visuals never feel as raw or dirty as Fallout or even RAGE, its combat doesn’t achieve the intense strategic highs of FTL, and its overworld encounters serve mainly as a nuisance, rather than as a series of complex choices. Convoy is a mish-mash of good ideas, ideas that jostle with each other intensely, but never quite harmonize. With a chaotic and entertaining post-apocalyptic setting, and some fairly competent tactical car smashing, Convoy should work a lot better than it does. It's in the little details that Convoy comes unstuck, however, and ultimately fails to be a great strategy game, a great post-apocalyptic game, or a "great choose your own adventure game", rather a solid amalgamation of the three.